This F3 hybrid of two of our best Himalayan cultivars is one of our finest creations to date. The seeds for this project were collected during an expedition to Northern India and Nepal, in the late 1960's. At this time both India and Nepal had thriving legal cannabis industries, catering largely to western tourists seeking the finest quality ganja and charas. During this period, Rolpa District, Nepal, was one of the main sources of charas and ganja consumed in the many hashish shops on "Freak Street" in Kathmandu. Rolpa District was home to the genetics responsible for the famed "Nepalese Temple Balls" sought after by so many. Farmers in the mountainous region took great pride in their work. Supplying the cannabis shops in the country's capital with top quality charas provided a generous, steady source of income to the people of Rolpa. Sadly this region fell on hard times in the mid 1970's, when cannabis laws in Nepal were changed, in order to appease western governments. Since the steep hillsides of this remote mountain district were unsuitable for cultivation of any crops other than cannabis, this area was unable to recover from their lost revenue, and has since fallen victim to extreme poverty. Our Kashmiri male who donated the pollen for this enigmatic landrace hybrid, came from the ancient village of Sirnoo, which sits along the famous "Mughal Road". 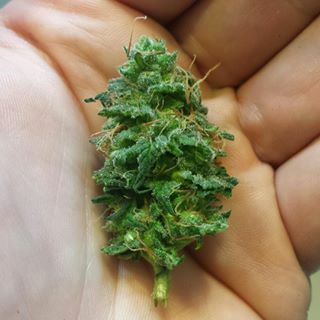 A unique, highland indica landrace with insane resin production and vigor, he was the perfect match for our Rolpa ladies. Expect strong limonene terpenes, backed by hints of musky sandalwood. Some phenotypes will exibit an exotic cherry cola aroma. The effect is calm, blissful euphoria, perfect for ridding the mind of apathy, and the body of pain. She makes excellent medicine for digestive issues, depression, anxiety, insomnia, fatigue, and nausea.